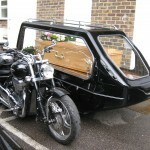 Allan James ‘ Wag’ of Cobham travelled on his final journey from his home in a Triumph Thunderbird Motorcycle Hearse to Randalls Park Crematorium for the funeral service. ‘Wag’ moved from Liverpool with his family as a young boy and lived in Downside, before moving into Cobham about 47 years ago. He trained and worked as a carpenter until his retirement. He was a very well know member of the local community, and was involved with a number of local clubs. A very keen gardener, and was still helping his friends and neighbours with theirs until recent times. His family decided on the more unusual type of transport to the crematorium, as he owned lots of motorbikes including Nortons and Triumphs and enjoyed re-building them. He had a motorcycle and sidecar which Carol his eldest daughter believes was a Triumph. Carol has fond memories in the 1960’s of trips down to Littlehampton from Downside with Mum and herself sitting in the sidecar. She remembers it had a roof, with a little door, so they were kept dry, whilst Dad braved the elements!